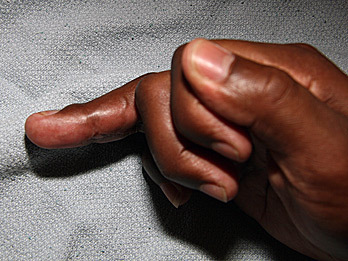 Jersey Finger is the colloquial term for tearing of the tendon that bends the tip of the finger. In each finger there are two flexor tendons that contribute to bending (flexing). One tendon, the flexor digitorum superficialis, bends the middle knuckle. The other tendon, the flexor digitorum profundus, bends the finger tip. It is this second tendon that is ruptured in a Jersey Finger. With this flexor tendon no longer attached, the fingertip can’t bend down anymore, though the middle knuckle will. Pain and swelling are common initial symptoms. The hallmark of the injury is the sudden inability to bend the tip of the injured finger. The nickname of Jersey Finger comes from the prevalence of this injury in athletes trying to grab an opponent’s jersey at the neck, and the grasping finger is pulled against forcefully as the opponent attempts to run away. For this reason, Jersey Finger injuries are commonly seen among football and rugby players. Speaking with you and performing a careful physical exam are generally sufficient to make the diagnosis, since each of the two flexor tendons in the finger can be tested on physical individually. An x-ray is obtained to evaluate for fracture, as sometimes the tendon detaches from the bone of the fingertip with a small piece of bone attached, rather than just tearing of the tendon itself. In chronic cases, an MRI may be useful to confirm the diagnosis and determine the location of the torn tendon. Rapid surgical treatment is necessary to achieve the best outcome. The torn flexor tendon needs to be reattached to the bone of the fingertip to try and improve the function of the finger. After surgery, a course of splinting and occupational therapy is required to increase flexibility and give more strength to the repair. As more time passes from the injury, the tendon shortens and the surgery becomes more complex. Delays may require reconstruction of the tendon and its sheath. Jersey Finger represents a significant injury demanding immediate attention. If you are suddenly unable to bend your fingertip call Hand Surgeon Dr. Pruzansky at 212-249-8700 to schedule a quick appointment and begin working to improve the function of your finger.